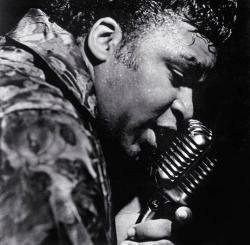 Solomon Burke (March 21, 1940 � October 10, 2010) was an American recording artist and vocalist, who shaped the sound of rhythm and blues as one of the founding fathers of soul music in the 1960s and a "key transitional figure in the development of soul music from rhythm and blues. He had a string of hits including "Cry to Me", "If You Need Me", "Got to Get You Off My Mind", "Down in the Valley" and "Everybody Needs Somebody to Love". Burke was referred to as "King Solomon", the "King of Rock 'n' Soul", "Bishop of Soul" and the "Muhammad Ali of soul". Due to his minimal chart success in comparison to other soul music greats such as James Brown, Wilson Pickett and Otis Redding, Burke has been described as the genre's "most unfairly overlooked singer" of its golden age. Atlantic Records executive Jerry Wexler referred to Burke as "the greatest male soul singer of all time".